Poland and the EU experience a period of tensions in their relations. What are the divise issues between them? Are they at odds concerning the principles of a democratic regime? Or are they engaged in a more tactical debate in the run up to the next European Elections in May 2019? EAP : Do you think the next electoral campaign in Europe will be focused on the clash of values between Western and Eastern Europe? Why ? The question of the European values play important role in Polish politics. I don’t think that issue will be crucial in the next election to the European Parliament. Now, the following issues are the priorities: security, energy security and energy independence; they will play a crucial role in the future campaign. The shadow for the future European elections is the German-Russian project of Nord Stream 2, which is seen in Poland, Denmark, Lithuania, Latvia and Estonia as an instrument of destabilization the unity of the EU. From the energy security derives the questions of values for future: how the UE will define the axiological background for security? Is it still possible to find the European unanimity for security? EAP : What are the main political forces in Poland ? And what are their respective positions concerning Europe? 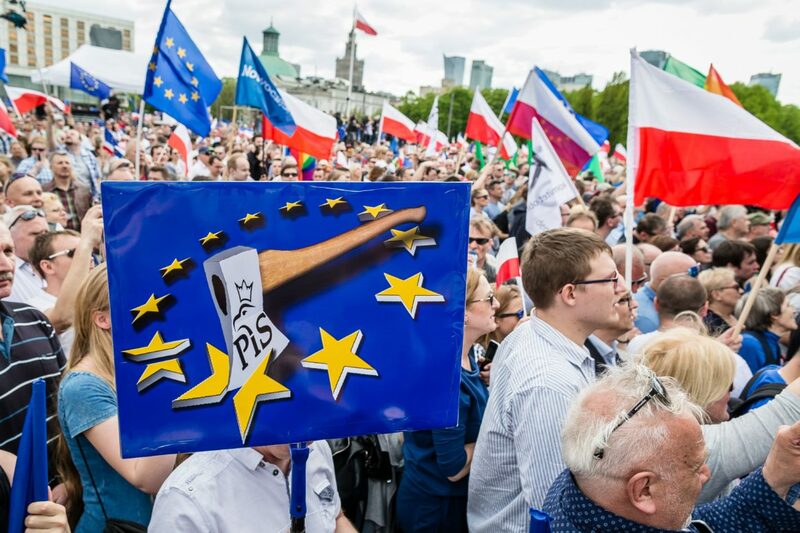 Two parties in Poland will play the crucial role in the European elections on March 2019. Prawo I Sprawiedliwość (PiS) : Law and Justice party, Polish right wing on the one hand. On the other hand Platforma Obywatelska (Citzen Platform), now centre-leftist party. EAP : What is your agenda for Europe ? “After-Brexit age” is coming soon. European leaders have to deal with old and new crisis, after Brexit. In the terms of economics and finance, perhaps the most serious challenge takes place in designing the new European budget without UK for the next financial perspective. The second most important challenge is that, the birth of new sources of protests in Europe, which could brake down the EU in the future. In France, the protests of “gillet jaunes”, could be labelled as a “French cognitive protests”. The protesters are well educated, often represents lower middle class, but the costs of living are unbearable for them. This is not only the problem of France, due to the same economic crisis in other EU countries. If the protests diffuse to other European countries, it will certainly affect the future elections and also the politics of the future European Commission. I would stress the most important European axiological challenge for the next EU Parliament by paraphrasing the slogan “make European unity great again”. For that aims we (“we” I mean ‘we-European’) should rediscover the values as solidarity, security, as well as, identity. After Brexit, “de-Westernization” of Europe will appear, so that, the countries like Poland and Romania would play more important roles in the processes of shaping new European axiology. The differences between the East, Central and Western Europe are not the obstacles but also a challenge for constructing new axiological line for the politics for the next decades. It will be also the role of European Commission to find a solution for the unity. I think that very important task is that, return to the dialogue between post-soviet area (Caucasus, Ukraine, Kazakhstan) and European Union. The instruments, like an Eastern Partnership should be extended to the countries of post-soviet Central Asia for seeking the partners for EU. Dr. Cezary Koscielniak, political philosopher, historian of ideas, and essayist. He works at Adam Mickiewicz University in Poznan, Poland. Field of research: political philosophy, religion in public life, European affairs, and cultural international relations. He published: “New Critics Toward the Church”, “University, Development, Culture” (in Polish), “Freedom, Equality, University” (co-editor, in English). In 2012-2013 he served as an expert to the Chancellery to the President of the Republic of Poland, in 2018 he was a Chief to the Cabinet of the Minister of Cyber Affairs.